Email has been a communication mainstay for decades, and it’s use is growing about seven percent per year. How can we handle more email if we’re already overwhelmed? How will we stay responsive to our colleagues and to our clients? How will we survive the daily onslaught and maintain our work quality and our sanity? This program answers those questions. It demonstrates an effective and efficient way of handling virtually any amount of email. Gaining command of email reduces stress, increases focus, and produces a better work product. These all add up to a better professional experience, which is how work/life balance is truly achieved. A simplified workflow model to demonstrate where email processing resides in our day. A proven system from the medical field – triage. Triage is a quick and effective way to sort patients to determine their medical priority. It’s essentially a sorting and queuing mechanism that we can adapt to make email easier to handle. 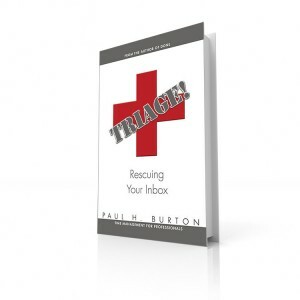 How to use Microsoft Outlook to maximize this email triage system. With the new system described and in place, we’ll set sail for a happier, more productive workday!